The Refine® Internal Breast Suspension system is one more tool to assist with our Scarless Breast techniques. Made of well accepted suture material, the Refine® system acts as an internal anchor to help lift and support the breast. Dr. Jeffrey Hartog is the first surgeon in Florida to introduce the Refine® device, and one of a handful of surgeons in the US and worldwide to be trained in it's use. The Refine® system is usually used in combination with other techniques such as fat grafting to the breast, breast lift or reduction and even with breast implants, to enhance the results. Dr. Hartog has also pioneered the use of the Refine® device to help lift and support the upper abdomen in combination with abdominoplasty or the reverse abdominoplasty (RAFT) procedure. 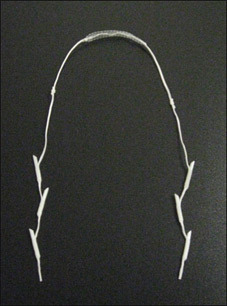 The device, pictured below is placed with specially designed needles, and requires no long incisions for minimal or no scarring. To learn more about the Refine® device and other methods of scarless breast reconstruction and breast augmentation using fat grafting in Winter Park, Orlando, and nearby Central Florida communities, please contact the Breast Center at the Bougainvillea Clinique to schedule a consultation.